Singer songwriter, Patrick Ballantyne, has a new single, Someone You Should Know now available via itunes. The tune has an upbeat rhythm and a catchy melody along the format of I Walk The Line featuring the Oh Chays. This single is on the heels recent release, Days Of Rain, a rocker with a lot of different sides. Here's a summary of Day's of Rain for reference: King Of The Road has an almost alternative pop feel but a seriousness about it. Lift Me Up is another solidly written melody with keys and a tight bottom. I've Got A Feeling is a very melodic folk track with well blended vocals and only the simplest of acoustic guitar backing. Very nice. Title track, Days Of Rain, is really a tight orchestral piece, more of a lead in to one of my favorite tracks on this earlier release, Hundred Year Flood. 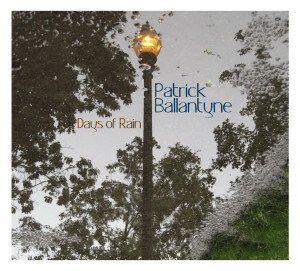 A solid acoustic rocker shows Ballantyne's strength as a songwriter with it's enchanting melody and slide guitar work. Wrestling With The Devil has a radio rock feel... strong pop sense and solid melody. Christmas Day is another well written ballad with a sophisticated melody. Creating emotion and dynamics with only the basic of instrumentation is really nice. Who Am I has an "Eastern" flavor with percussion and sitar. With a possible nod to the Beatles this track is interesting. Roll With It, a quiet folk rocker has well woven vocal harmonies and bright acoustic guitar rhythm. I Follow You is another strongly written light rocker with a western flavor. Bob Dylan like harmonica work blends nicely against light steel guitar vamps and vocal duets. Very nice! I'm Yours strays further into the country vein but in a very clean way. Tight male vocal duets give this track an almost Kinks like sound. As Soon As I Find Her has a bit of a Neil Young feel. The harp by Kelly Hoppe, is really nicely executed. Wrapping the release is The Devil's Note. With a resemblance to a eurofolk tune but with strong North American styling, this is a really nice track as a closer. Although Someone You Should Know is not on this earlier release, I felt that the track would benefit from some basic background of Ballantyne's earlier work.